The artist’s practice confronts visual perception and the interpretation of what we see, exploiting elements that influence vision such as embodiment, reverie, and ocular phenomena. By decontextualizing what the viewer expects of billboards, using the optical recursive void and offering a stereoscopic 3D viewing potential, Any Day Now underlines connections between visual attention, wonder, and possibility. The form and purpose of the billboard itself is revisited within the work. Billboards seek to catch our eyes through bright colours, bold fonts, and rapid messages. Any Day Now is formed by the space surrounding it; instead of showing or telling, it provides a mirroring of space for contemplation. Its message is revealed through reflection: any day now, a new sight; a moment of wonder; any day now, an escape. 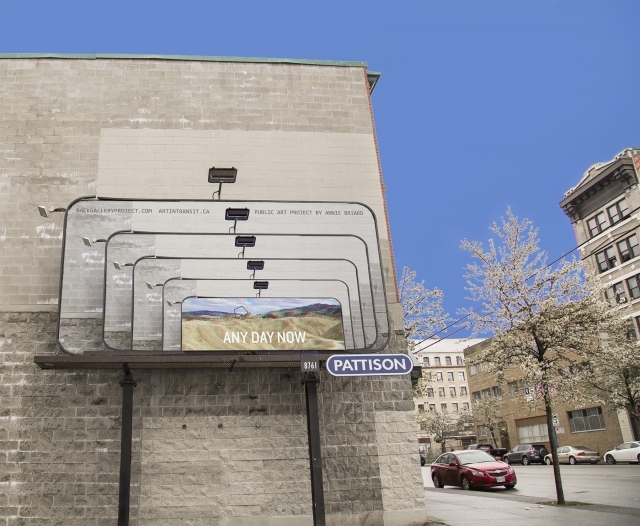 This project is the third and final iteration of Back Gallery Project’s Strathcona Billboard Project in partnership with Pattison Art in Transit and will be unveiled at Capture Photography Festival.